The Ontario Energy Board (OEB) Market Surveillance Panel (MSP) last week released its Monitoring Report on the IESO-Administered Electricity Markets for the period from May 2013-October 2013. For the most part, the report is painfully boring and treats the irrelevant as if it's important, but it was interesting, to me, that for whatever reasons they spend time attempting to discredit claims that exports are subsidized, particularly as they site an example of those claims as an article by my friend, Parker Gallant. 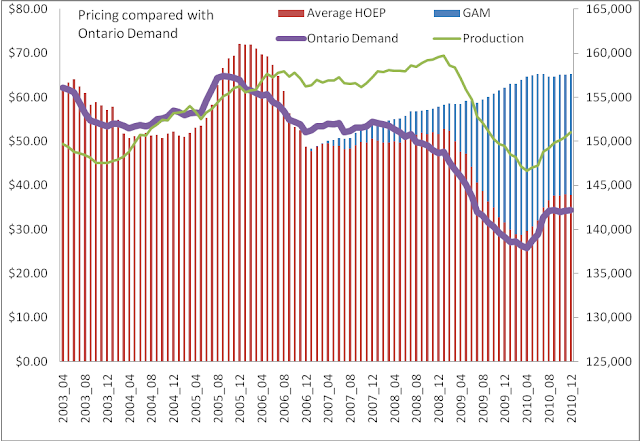 Over the past year, the role of electricity exports in the Ontario market has been the subject of considerable commentary. Questions have arisen about the value that export transactions provide to Ontario consumers, and more specifically around the question of whether and the extent to which Ontario ratepayers are subsidizing export transactions (in other words, paying costs that are incurred as a result of export transactions). Two recent press reports have claimed that Ontarians paid over $1 billion to subsidize export transactions to neighbouring jurisdictions in 2013. The Panel considered the methodology that was used in arriving at this estimate, and examined in greater detail the costs that are triggered by exports to determine the extent to which those costs are not fully covered by the market price or by other charges paid by exporters. I've added some emphasis to explain the premises required to fulfill the OEB MSP fantasy. Over the past year professional sycophants may have taken direction from their government master to make something up to counter the reporting of Parker Gallant, and the NDP, but it is closing in on 4 years since I wrote McGuinty Thinks This is Fun? Re-reading that post now makes me hesitant to continue here - I rebutted this drivel 44 months ago. According to the IESO, Ontario exported 18.3 TWh of electricity in 2013, which was sold wholesale at an average price of 2.65 cents/KWh to five neighbouring jurisdictions: Michigan, New York, Minnesota, Manitoba and Quebec. Power generated in Ontario cost 8.55 cents/KWh to produce, with Ontario ratepayers picking up the difference through the Global Adjustment Charge. Ontario ratepayers subsidized electricity exports to the tune of $1.079 billion, or around $220 for each of Ontario’s 4.9 million ratepayers. When the NDP critic, Mr. Tabuns, speaks of exports and subsidies, one could quibble with the vocabulary, but not the meat of the argument. I increasingly found the word "subsidy" unhelpful, and avoided it in last year's Ways to estimate Ontario's losses on electricity exports. While the average export revenue methodology reflected in both reports provides a fairly accurate estimate of revenues, the Panel believes that their approach to estimating average cost is overly simplistic, and does not appropriately assign costs to their causation. All of the costs associated with procuring, generating and delivering electricity are recovered from end-users; for present purposes, these end-users can be categorized into Ontario consumers (i.e., those with physical load in the province), and exporters. ...The Panel reviewed both the capital and variable costs associated with serving demand, and asked: “Would these costs have been incurred had there been no export transactions?” The subsidization of exports only becomes an issue if export transactions induce a cost that is not fully covered by the market price or any out-of-market charges paid by exporters. This seems to state Parker Gallant and the NDP's Tabuns were both correct that over $1 billion more was spent to procure the power exported, using the average cost of a procured megawatt-hour (MWh), but that power would have been purchased anyway for reasons we'd all understand if we weren't ignorant. If you've read my blog for close on 4 years, you probably disagree with that claim. 4 years ago I showed a couple of graphs in my second blog post, indicating the market did function in terms of relating market price and demand. The global adjustment mechanism, introduced to ensure full recovery of supply cost from suppliers, became the driver of oversupply - and therefore is responsible for escalating exports. In July 2011 I co-wrote, with Parker Gallant, an article for the Financial Post "Ontario's Power Trip" series, using the correct term in the title: title; Power dumping. Electricity has been getting contracted in Ontario with the intent of exporting it at low prices - to meet non-power system goals. There were no more large feed-in tariff (FIT) contracts awarded after that article ran in July 2011; there was a curtailment in the Korean Consortium deal that the government claimed would save $3.7 billion. This could provide some optimism that attempting to figure out how the market is being mangled is a valuable pursuit. I don't think the same can be said for the poor sycophancy displayed by the OEB's MSP report. Some readers may be upset I label the sycophancy poor, but it is. The Energy Minister frequently claimed all revenues from exports were profits - although there was never a strong indication he had any idea what the numbers he was spouting meant. How can the MSP argue if we pay $135/MWh for all generation an industrial wind turbine can generate, and we dump it on an export market for $15/MWh, it's not simply not subsidized, but it is in fact a profitable enterprise? The OEB MSP report shows one class of Ontario customer paying ~$89/MWh for electricity in the summer 2013 period (up $15 from summer 2012) , the largest users paying ~$53 (up $5 from the 2012 period), and omits export customers paying about $22.5, down from ~25 the previous summer. The wizards on the market surveillance panel explain that the many prices produced by this hybrid market are each never too high, nor low, but exactly what they should be - while doing absolutely nothing to examine causes of the large variances in pricing.